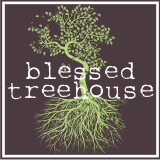 Blessed Treehouse: My children survived . . .
. . . And I only turned to chocolate once! I thought I'd share a progress report, of sorts, because I'm praying that I make progress. Oh, and I really like lists. Changed diapers when they needed to be changed rather than when I got to them. Drank more water than I did caffeine. Managed a 30-minute nap for myself. Let the dog back in. Wiped my son's snotty nose more times than I can count. Tidied up the kitchen (including loading the dishwasher). Responded to about a dozen emails. Carted both kids and myself to my mom's house for dinner. Brush my teeth before 5pm. Get out of the house to do something enriching with my son. So, those of you with multiple children, how long before I can expect this to be ONE list? Ever? You actually got quite a bit done-I am impressed! At least there was a shower in there. Definitely something to be proud of. There's nothing like brushing your teeth for the first time right before dinner. I totally understand that one! the plural of it all. I've learned to make a list and I give myself all 5 days that I have off from my paid job to get them done. Jackson is now 16 months and this past week I got 8 out of the 10 things done. I was very proud of that! Don't be too hard on yourself. You are not super woman. As long as those kids know they are loved...you are doing 100 % of your job. PS....you got way more done than I ever did at that early stage. PSS....I still take my showers at night. It seems so much easier then. not to be a debbie downer or anything, but NEVER! it never ends. you can never get it all done. make a shorter list :) love you. glad you are feeling well enough to do all that! uh, no I don't think the lists will ever meet...I know, I know. But they will blend or you just don't notice as much. Glad you are feeling up to accomplishing a lot and noticing what you want to get done! There will be days when nothing on either list gets done! And that is okay! Life happens and if the kids (or you) miss a bath one day, no biggy. I have learned not to sweat the small stuff.